It wasn’t always this way, to be sure. I have made more than my fair share of staffing mistakes. In fact, they’ve been my biggest as a leader. I think I’ve chronicled almost every one of them in my book, What They Didn’t Teach You In Seminary (Baker), still one of my favorite books that I’ve written. Painful, as it involved sharing a lot of “learning through mistaking,” but a favorite. 1. We hired from within. I’m continually surprised by how few organizations do this. The biggest reason to look from within your own ranks first is simple: they already have your DNA. There is also a sense where you know what you are getting. But DNA is the biggest issue. They inculcate who and what you are in a way no one else can. Some might find this insular – I find it protective. It’s easy to stretch yourself as a learner – it’s not so easy to flesh out a culture. 2. They came to Christ here. There is no substitute for someone who is a product of your mission. Their loyalty is off-the-charts, and you never have to convince them “why” you do “what” you do the “way” that you do it. They are the poster child. If you’re in a business, think of hiring your most rabid fans. Regardless, the product of what you are trying to do is often the best recruit. 3. They passed the “beer” test. Sorry if that’s offensive to some of you, but it’s part of Meck’s internal culture. We have a saying about people: “Do they pass the beer test?” Translation: If at the end of a long, hard day of work, would you want to go out and have a beer with them? If the answer is “yes,” they passed. I think most of you know that this is about chemistry. 4. We don’t have to be suspicious. Have you ever spotted someone talking to someone else in a hallway, or out in a parking lot, and got a pit in your stomach wondering about the conversation? In other words, you wondered whether it was divisive, undermining, gossipy, slanderous… or mostly, if it was about you? Never, ever hire anyone you are suspicious about. We all know to hire for character, but few throw in the idea of “relational” character. Are they a “safe” person relationally? 5. They have a bias for action. I’ve long said that I would rather rein someone in than kick them forward. There is no substitute for being catalytic, meaning someone who initiates, takes charge and creates action. Some people have a “ready, ready, ready, ready” mentality instead of a “ready, aim, fire” mentality. Go for the fire. 6. This is what God wants them to do. There is a significant difference between someone who wants a job, and someone who is answering a call. I’m not simply offering employment – I’m offering a life investment. I’m offering a way for them to fulfill God’s clear direction and invitation. Meck is a fantastic place to work, and many, many want to work here – but what is most important is whether working at Meck fulfills a clear sense of life-calling. 7. They’re good at what they do. In a word, they are competent. Very competent. They have a skill set, an aptitude, an intellect, an ability that matches the job. There’s no sin in hiring this way, even for a church. 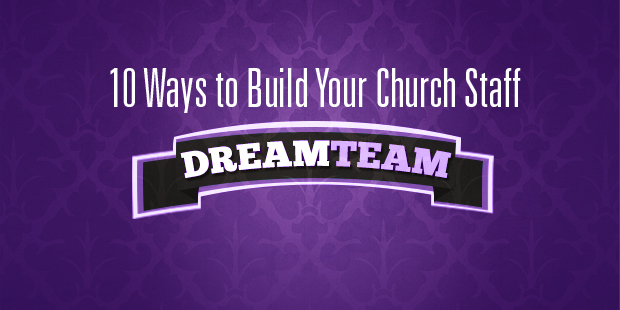 People can be a ministry, but you shouldn’t hire them as one. I look for people who are “tens” where we need them. And we need them in every role. 8. They do not need to be, or want to be, micro-managed. This may speak more to my personality, but I have no interest, desire or time to micro-manage anyone or anything. I remember reading of a 33-page government manual outlining how to buy hammers. If I had to oversee that, then shoot me now. Just hire someone you trust to buy them! If they can’t be trusted to do it, hire someone who can! This also goes to the way people need to be managed. If someone comes to my door every morning wanting to know the five things they should do that day, again, put me out of my misery. I want people who will figure it out, chase it down, and keep me in the loop. 9. If you didn’t pay them, they would still be serving, attending and giving. This is key. They are doing what they love, doing who they are, and doing what they believe in. If it’s just for a paycheck, then they don’t have real passion or commitment. When you have someone who would do what they are doing even if they weren’t being paid, you have a keeper. 10. They get the mission, and as a result, are mission-animals. I know I alluded to this under the idea of “hiring from within,” but even people who come from your mission may not be committed to it afterwards (that’s another blog, to be sure). You want people who truly embody, understand, live and breathe the mission. At Meck, this means they “get” who we are after (the unchurched), and are unwavering in that pursuit. So what makes Meck’s staff special? We strive to have everyone on staff reflect all ten. And if I can brag on my team, they pretty much do. Learn more about developing your staff team – connect with an Auxano Navigator. > Read more from James Emery White. James Emery White is the founding and senior pastor of Mecklenburg Community Church in Charlotte, NC, and the ranked adjunctive professor of theology and culture at Gordon-Conwell Theological Seminary, which he also served as their fourth president. He is the founder of Serious Times and this blog was originally posted at his website www.churchandculture.org. Is Your Organization Optimized for Efficiency or Strategic Agility?